Below is a list of questions and answers pertaining to the colon detox, the first step to cleansing toxins out of the body. Use the links on the right to scroll through our full body detox program — the most comprehensive detox program that you can do right at home. 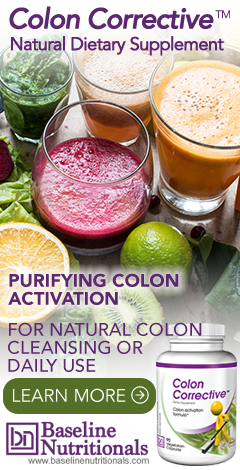 Colon cleansing is not the end of detoxing–it’s merely the first step. Colon detoxing, as we’ve previously discussed on this site, is required to clean out the elimination channels so that toxins released from the other forms of detoxification have a clear path out of the body. But the major work of detoxification, the dramatic improvements in health that most people are looking for, come more from those other detoxes than from colon cleansing. Do I need to change my diet during this colon detox phase? Do I do the heavy metal cleanse during this colon detox? Will the Detoxifier drink interfere with my medications? What is a normal bowel movement while doing the colon detox? What is the right amount of colon activator? Will I experience gas and bloating? Can I become addicted to the herbs recommended? Are there any special concerns if I have Crohn’s disease? What if I miss a day on the colon detox? Some of the recommended ingredients absorb drug residues. What if I have to take medications? Can I do the colon detox if I get food poisoning or the stomach flu? Should I continue taking my vitamins and other supplements during the colon detox? Why am I experiencing rectal bleeding? Is it normal to have abdominal tenderness? What should you do if you are taking the recommended dose of Colon Corrective and are having frequent bowel movements but very little waste? 1. Do I need to change my diet during this colon detox phase? There are no food restrictions on the colon detox, but be smart. Reduce your intake of what causes the problem in the first place: processed foods, excessive amounts of meat, commercial dairy, and sugar. Try to eat more fruits and veggies. 2. Do I do the heavy metal cleanse during this detox? Yes, if you are doing the Metal Magic™, now is the time to take it. Although not mandatory, it makes all the sense in the world to do the heavy metal detox and the colon cleanse and the same time. The two detoxes complement each other. However, you do not want to take the Metal Magic™ and the Colon Detoxifer at the same time each day. In fact, any supplement or medication you are taking, including the Metal Magic™, should not be taken within 20 minutes before or 60 minutes after the colon detox powder so that there is no chance the Detox powder will absorb the medication or herbal remedy. The problem is probably more theoretical than actual, but why take a chance. The Metal Magic™ pulls the heavy metals free out of your bloodstream and out from your body’s soft tissue and then safely carries them out of your body. The Colon Detoxifier draws heavy metals out of the walls of your intestinal tract and colon and then safely passes them out with your stools. The two work together nicely to pull toxins out of the body and safely out the colon. 3. Will the Detoxifier drink interfere with my medications? No, but to be on the safe side, it’s recommended that you take any medications a minimum of 20 minutes before or 60 minutes after the colon detox powder so that there is no chance the Detox powder will absorb the medication. 4. What is a normal bowel movement when detoxing? A normal bowel movement is soft and unformed. It should break apart when it hits the water — or at least when flushed. This is not to be confused with diarrhea, which is characterized by water. 5. What is the right amount of colon activator? It’s when you sit down on the toilet and say, “WOW!” It’s when you finish and look down and say, “Did all that just come from me?” In other words, if you have to ask if you’re taking enough, then you’re probably not. And, because Jon’s formulas are more than just fiber, don’t always expect to see the form of your colon in the toilet. 6. Will I experience gas and bloating? If you were to start a car that had been sitting idle in the garage for years, you would not expect it to start right up. You would expect to have to crank it over several times. You would expect it to blow some smoke, to backfire several times, maybe even shoot some flames out the tail pipe — but then settle down and begin to purr. Your bowel is no different. Gas and bloating are the smoking and backfiring of the bowel. Work through it. Once you have rebuilt your bowel function, your intestinal tract will begin to purr like a well-tuned engine. 7. Can I become addicted to the herbs recommended? Unlike harsh chemical laxatives, it’s practically impossible to become addicted to natural herbs. Not only are these herbs not addictive, they actually work to strengthen bowel function. In fact, there is no problem with continuing to use Colon Corrective indefinitely, even after finishing the Intestinal Cleanse. 8. Are there any special concerns if I have Crohn’s disease? Yes. If you have an overactive colon, then you do not want to take the Colon Corrective, which would increase that activity even more. If you have diarrhea or an overactive colon, start with the Colon Detoxifier to soothe and calm your colon down. Eventually, as your colon function returns to normal, you may want to incorporate some Colon Corrective into your program. 9. What if I miss a day of the colon detox? The more consistent you are, the better overall results. If a dose is missed, make it up one hour after you have taken your next scheduled dose and take the Detoxifier for an extra day or two to finish the bottle. 10. Some of the recommended ingredients absorb drug residues. What if I have to take medications? To be on the safe side, it’s recommended that you take any medications a minimum of 20 minutes before or 60 minutes after the colon detox powder so that there is no chance the Detox powder will absorb the medication. 11. Can I do the colon detox if I get food poisoning or stomach flu? Absolutely. One scoop of Colon Detoxifier taken with a glass of water (or 9 capsules) will often help control the problems of mild food poisoning or stomach flu in as little as 20-40 minutes. If one dose doesn’t work, try a second dose. Also, a strong dose of garlic, or garlic formula, is highly recommended in these situations as it is highly antiviral, antibacterial and antiparasitic. 12. Should I continue taking my vitamins and other supplements during the colon detox? During the intestinal detox, you can continue to take all of your supplements. When it comes time to do the liver detox, give your body a rest and use just essential supplements. To be on the safe side, it’s recommended that you take any supplements or medications a minimum of 20 minutes before or 60 minutes after the colon detox powder so that there is no chance the Detox powder will absorb them. 13. Why am I experiencing rectal bleeding? 14. Is it normal to have abdominal tenderness? No. You may experience muscular movement, along with occasional cramping and aching, but these effects are minimal. 15. What should you do if you are taking the recommended dose of Colon Corrective and are having frequent bowel movements but very little waste? People should experience 2-3 bowel movements a day. This is normal. It’s possible that you could reduce your dosage if you are having more movements than that. This should regulate your system accordingly. Remember, with more movements, your waste content will be substantially less because you’re going more frequently. This is my first heavy metal cleanse and I purchased the Phase I kit. However it only comes with 2 bottles. Do I need to buy 4 more? I thought I read I need 6 bottles. If you have never detoxed heavy metals before, an initial 6-bottle heavy metal detox is recommended. Then, two, 2-bottle detoxes a year should be all that’s required for maintenance, barring special circumstances. Since most people detox once a year, the kit only has 2 bottles. So, you can add more if this is your first time. Thanks for the great info and products. This will be my 3rd detox. I believe I have a moderate case of candida and I’m wondering what the most effective anti-candida strategy is: stick with the 30 day program, or do the accelerated 10 day one, or does it make a difference? I’d prefer to use the accelerated schedule IF it’s likely to be as effective against candida. I’m 10 days into restricting myself from sugar and simple carbs, and taking Pau D’Arco and immune boosting teas, incorporating anti-candida foods such as garlic, lemon, olive oil, spices, and plenty of greens as well. I’m looking to structure the cleanse for maximum anti-candida effect. Thanks in advance!